Why Choose the Sign Language Interpreting Program? The Department of Human Services in the College of Education and Human Services offers a Bachelor of Science completion degree in Sign Language Interpreting (SLI) designed for students who have previously completed an associate's degree in sign language interpreting. Today's interpreters work with a variety of deaf consumers – those who acquired American Sign Language (ASL) as their first language, those who communicate through a form of visual English and those who use a contact variety of English and ASL. Interpreters also work with a variety of hearing consumers, some of whom are familiar with American Deaf culture and the process of interpreting, and some who are communicating with a deaf person for the first time. SLI courses cover a variety of topics and are designed to enhance current knowledge and skills, building on the foundation that was formed in the Associate level programs. The Registry of Interpreters for the Deaf Inc., (RID) a national membership organization of professionals that provide sign language interpreting/transliterating services for Deaf and Hard of Hearing persons, provides a National Testing System which certifies qualified interpreters. Applicants must hold a Bachelor's degree in order to apply for RID certification testing. Please visit RID’s website for more information. The objective of this program is to prepare students to enter the field of sign language interpreting as a professional who can make a significant contribution to the deaf community and the field of interpreting for the deaf. Interpreters must be proficient in both English and American Sign Language. In this program, students will complete 40 semester hours of professional requirements focusing on sign language interpreting and Deafness' and approximately 24 semester hours of general education courses beyond those completed at the Associate degree level. This will vary depending on any additional general education courses previously taken. Courses are offered through various delivery methods for maximum learning opportunities and interacting with peers, including traditional classroom meetings, online, and hybrid. On-campus classes are offered one night a week with times beginning at 5:30 to encourage full time employment or taking other course work. Course focuses on ethical standards of practice, legal rights and federal legislation impacting deaf and interpreters. Critical thinking, self-awareness, emotional intelligence, and application of the Code of Professional Conduct will be emphasized. Study of the linguistic, cultural, and societal context of the Deaf community in America. Both historical and contemporary aspects of Deaf identity will be included, with an emphasis on the central role that ASL plays in the lives of Deaf individuals. Linguistic analysis of American Sign Language and spoken languages. Includes the study of phonology, morphology, syntax, semantics and other linguistic topics. Students advance their skills in producing equivalent spoken English messages in natural, idiomatic language from signed source messages. Continuation of English and ASL vocabulary development, interpreting analysis skills, and strategies for team interpreting. Enhancement of the ability to interpret between the source and target languages of ASL and English. Interpreting models, consecutive and team interpreting will be explored. Students will increase interpreting analysis and mental visualization skills. Theoretical foundations related to best practices and educational interpreter performance. National, state, and local standards/requirements will be covered, including the EIPA. Educational settings and communication methods for Deaf and Hard of Hearing students will be discussed along with social, cognitive, and language development and the interpreter’s role in facilitating student independence and self-advocacy. Specialty settings of medical, mental health, legal, deaf-blind, or oral interpreting will be covered. Discussions will include ethical decision making, specialized vocabulary, and legal ramifications. Students will demonstrate specialized vocabulary and sign competence. Enhancement of the ability to produce an equivalent message, working simultaneously between the source and target languages of signed and spoken English, focusing on text analysis and self-evaluation, and working lengthy segments of discourse. Continues enhancement of ability to produce an equivalent message, working between ASL and English. Interpreting linguistically complex messages will be investigated, and expanded to idiomatic expressions, higher registers, and working lengthy segments of discourse. Student will identify a community or professional need and develop a project plan to benefit the community and/or profession. Student finalizes their program portfolio and conducts a critical self-assessment, demonstrating appreciation for lifelong learning. To be eligible to enter the SLI program candidates must have graduated from an Associate degree level interpreter training program. That program will provide ASL courses, deaf culture, linguistics and interpreting course work, in addition to a practicum experience year. 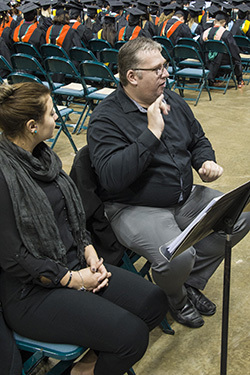 There are several programs in the state of Ohio that have an Associate degree in Sign Language Interpreting that would serve as the basis for gaining the skills, knowledge and degree needed to transfer to Wright State and complete the Bachelor degree. American Sign Language (ASL) is the third most common foreign language used in the United States. Students at Wright State can take ASL to fulfill the foreign language requirement in their major. Two full years of language courses are offered, and students can begin taking the series of courses in any semester. In addition to sign language basics, grammar and sentence structure, students are exposed to Deaf culture and community.